Now, I'm sure I'm in the minority with this next statement but I wasn't a big fan of "Follow the Leader." I mean, I thought it was cool but it was NO WHERE close to their previous stuff. But when I heard "Microphone Fiend"?!?!?! Now I was back to being in awe again. Maaaaan...I honestly can't explain how freaking dope "Microphone Fiend" is. "After 12, I'm worst then a gremlin/feed me hip hop and I'll start trembling"?!?!?! There are those quotables again. But on a whole I can't front, I wasn't a big fan of the "Follow the Leader" album. Again it was dope but like 3000 said "you're only as funky as your last cut" but in between albums we at least got a nice 'lil treat with "What's On Your Mind" off the "House Party 2" soundtrack. I remember me and my team were watching the Rap Mania concert and when Eric B. and Rakim hit the stage and the beat for "Let The Rhythm Hit 'Em" dropped....maaaaaan, it felt like old times again. I don't know if it was seeing them dudes live or hearing "Let the Rhythm..." for the first time but I hoped with this new album I'd be back on my Eric B. and Ra jawn. But ummm...it didn't turn out like that. Off "Let The Rhythm..." the only jawns I was really feeling was "The Ghetto" and "Mahoghany." Which was STILL a far cry from the classic we got with "Paid In Full" and do I really even need to talk about the "Don't Sweat the Technique" album? Naw...I didn't think so. At this point in the game, the god MC seemed to be falling in line with the other greats from his time, Kane and KRS. All them cats seem to be basically making albums...to just be making albums. And just like with my #5 pick, who has to swoop in to help save the day? None other then my #1 producer EVER Primo. I remember the exact place I was when I first heard "It's Been A Long Time." I was on Broad Street with my peoples L.G. and Eric about to past the Logan train station headed down South Street and Power 99 played it and we were all in the whip feeling like when Jordan came back from retirement and dropped the double nickle at the Garden. 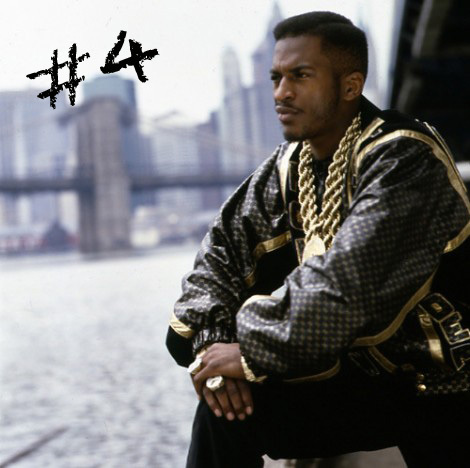 Rakim's first solo album "The 18th Letter" was no "Paid In Full" but to me it was Rakim's best output of music as a whole since "Follow the Leader." Rakim went on to release "The Master" and "The Seventh Seal" but to be honest, I didn't even check for either of those jawns. But to me, it doesn't matter how Rakim's career ended, it's all about what he did for the game and for that I'll always be grateful to the god. Salute. The fiend of a microphone, I’m the microphone fiend."